True Quiet rollerblade style office chair wheels are professionally engineered and designed in the USA, manufactured with the highest quality of materials, and passed the SGS ANSI/BIFMA X5.1-2017 Durability Test that guarantees the 5 wheels can safely support more than the industry standard weight of 375lb and will last you a lifetime. Aviation-grade carbon steel components provide maximum durability. Highest-grade polyurethane provides the elastic, soft and vibration absorbing wheel-shell. Our newly engineered and designed wheel profile, reduces floor contact and provides for a whisper quiet work space. State of the art precision ball bearings provide maximum ease for pivoting & turning. Move around your workspace with ease with our Skate-style wheels. The modern yet classic design works with any style of furniture. The elevated 3” wheel keeps the debris and hair away. The universal caster stem size (7/16" diameter) fits 99% chairs. Just pull out the old wheels by hand and push in the new True Quiet wheels for a quick & easy installation. Buy with complete confidence, Ture Quiet wheels are backed by our manufacturer 30-day money back guarantee with a 1-year free replacement warranty. 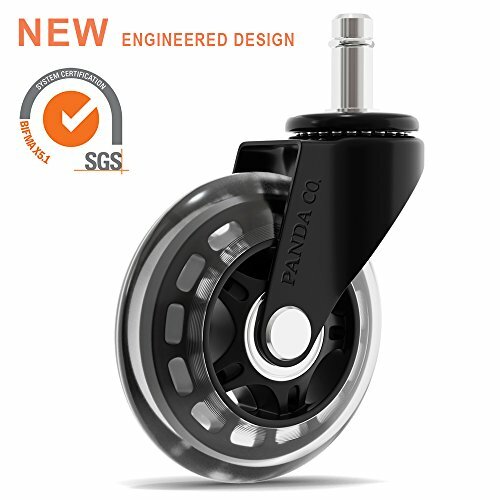 SGS DURABILITY CERTIFIED - The highest quality aviation-grade carbon steel components provide maximum durability; our casters passed SGS ANSI X5.1-2017 durability test; performance exceeds the industry standard support weight of 375lb; it's THE CASTER THAT'LL LAST A LIFETIME. If you have any questions about this product by Panda Co, contact us by completing and submitting the form below. If you are looking for a specif part number, please include it with your message.